CHARLESTON, W.Va. (AP) — The attorney for a West Virginia Supreme Court justice who wrote a book chronicling political corruption in the state and now is on trial tried to cast doubt on the federal government’s belief that Justice Allen Loughry used his office for personal gain. Attorney John Carr made his opening remarks at the start of Loughry’s criminal trial Wednesday after a federal judge agreed to a prosecution request to drop three counts in the 25-count indictment. Most charges against Loughry involve wire fraud allegations that he used state vehicles and gas cards for personal use. Others contend Loughry made false statements, tampered with witnesses and committed wire fraud. Assistant U.S. Attorney Philip Wright said each detail of the case is like a piece of a puzzle that will “portray a picture of the fraud the defendant committed.” That includes records for vehicle reservations and fuel purchases, as well as cellphone data to track a person’s location. Loughry was suspended from his seat earlier this year after the state Judicial Investigation Commission said he kept secret a December federal subpoena served on the Supreme Court. He was replaced as chief justice in February after the other justices received another subpoena and found out about the first one. Separately, Loughry and three other justices were impeached by the state House of Delegates in August stemming from questions involving lavish renovations to their offices that evolved into accusations of corruption, incompetence and neglect of duty. 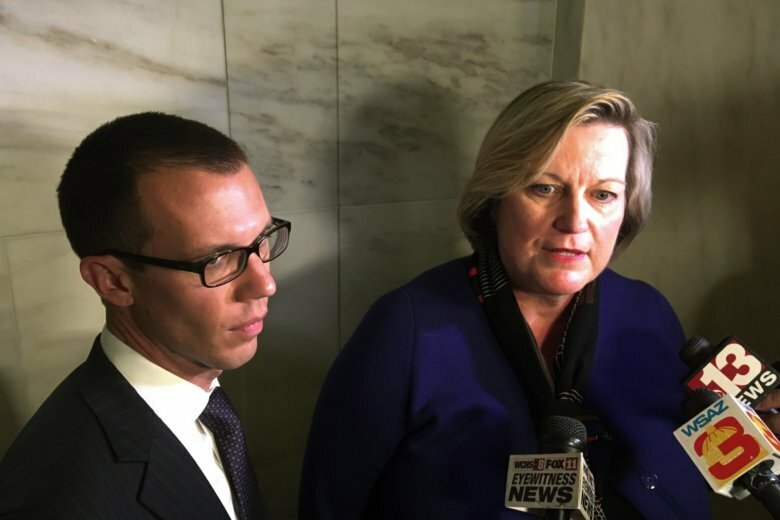 One of those justices, Beth Walker, was cleared of an impeachment charge Tuesday in a trial before the state Senate. Loughry and justices Margaret Workman and retired Justice Robin Davis face impeachment trials later. A fifth justice, Menis Ketchum, resigned before impeachment proceedings began. In federal court, Wright said Loughry tried to cover up his conduct, including allegedly planting false facts in conversations with a court official about spending, then reporting his own concerns to a federal prosecutor about others’ spending in the court. Loughry, in consultation with the other justices, had constitutional autonomy in deciding how the court system spends a $139 million annual budget. But a proposed constitutional amendment on the November ballot would give the Legislature more budgetary control over the judiciary. Loughry has repeatedly denied involvement in renovations to his office which cost $353,000 and included a $32,000 blue suede couch and a $7,500 wood-inlay floor map of West Virginia. He made one such denial to the House Committee on Finance in January. He blamed the spending on former court administrator Steve Canterbury, whom he fired in January 2017. One of the criminal counts accuses Loughry of lying when he told an FBI agent he didn’t know the desk he had transferred to his house had historical significance and value, determined to be $42,000. Loughry returned the desk after news outlets asked about it. “He willfully lied about matters under investigation,” Wright said. That includes Loughry allegedly planting false facts with a Supreme Court employee during a meeting about court spending, then going directly to a federal prosecutor to report his own concerns about spending by others in the court, Wright said. According to state records, Loughry signed for a state car for a total of 212 days from 2013 to 2015 but failed to list a destination for 148 days, including trips to visit family and for signings of his 2006 book. The indictment says he also sought mileage reimbursements for trips even though he drove a state vehicle and used a government credit card for gas. Carr said Loughry had no idea a reservation system existed and that the court also had no definition for the personal use of a state vehicle at the time. During Loughry’s book-signing trip to The Greenbrier resort, he discussed court matters and “did not make a dollar. They did not sell books there,” Carr said. Loughry did make trips to his native Tucker County as alleged by prosecutors, but Carr explained there was “intense fighting” amid court administrators over spending, so Loughry sought advice from probation officials back home.